There was probably a Norman Church where the present building stands, although nothing remains of it except the font which is now standing on a modern base. On the outside of the tower is an inscription in Latin, which translated, says: "In the year of Our Lord, 1507 (or 1512, this is not clear) this tower was built" There are some pieces of 15th Century glass in the tower window. The mutilated effigy of the Knight in armour outside the chancel screen is that of the founder, one of the de Saundebys. The inscription on the tombstone in the chancel stone, translated, runs: "Here lies William Saundeby, Lord of the Manor of Saundeby, and Elizabeth his wife, who died May 12th AD 1418. The builders of this Church. May God have mercy on their souls, Amen." 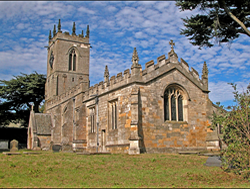 The manor of Saundeby passed into the hands of the Helwys, and in 1599 the tomb and monument on the north side of the chancel was erected. The touching inscription translated is as follows: "Here lieth buried the body of John Helwys, Esq., some time Lorde of this Manor, and Mary his wife, the daughter of Robert Blagden, of Thames Ditton in the county of Surrey, Esq., who left behind them two children, Gervase and Margaret, 7th December AD 1599. This is a work of piety, not of pride, and the work of deep affection, for in their own lifetime they taught me how I ought to honour them indeed. Thus it behoves me to live, and them to die." The ancient stone altar(since removed) in two pieces is embedded in the Jacobean table, and when the Church was restored by the liberality of the Rev. C Hudson, a former Rector, a reredos of gold and enamel mosaic in an alabaster frame, was erected, and the chancel paved with black and white marble slabs. The walls on either side of the altar are lined with alabaster and panels of red Verona marbles. The chancel screen is of English oak taken from one tree grown in Norfolk. There are three bells, two of them having inscriptions, "Jesus be our speed," and "God save the Church." The roof in English oak is divided into four bays and panelled. The carved principals, cornices, and other timbers are richly moulded. The choir stalls and all the seating in the Church were of good oak, but again, these have since been removed. The Jacobean pulpit was happily saved from destruction although it is plain in appearance. All of the glass in the windows, except the East one, are by Kempe and are some of his best work. Saint Martin was an army officer in France, and one day, during a very severe winter, he was riding at the head of a unit of soldiers through the gate of Amiens when he saw a beggar, with hardly any clothing and shuddering with cold. Saint Martin drew his sword, cut his cloak in half, and gave half of it to the beggar. After he had gone to bed that night, the figure of Christ, surrounded by his Angels, and wearing the half of the cloak that Saint Martin had cut off, appeared to him; and he was commended for his charitable and unselfish act.